Adhesives and sealants are important components of some of the major industries used to seal and joint various materials including steel and polymers. Adhesives and sealants can be differentiated on the basis of their chemical or physical reactions. 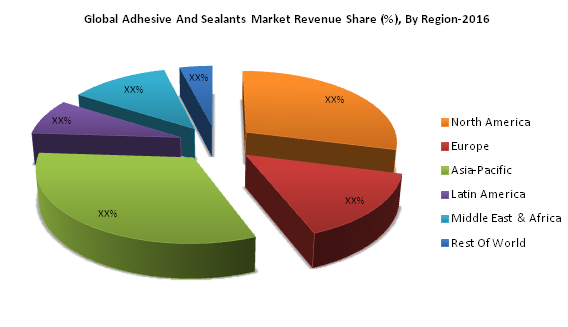 In recent years, adhesives and sealants market has increased by 4% annually, backed up by increasing growth in major end-users market such as construction and automotive. In U.S, after recession double-digit annual growth rate can be seen in single family housing, while commercial construction sector have also witnessed more than 6% annual growth rate. Rapid urbanization in developing nations further expected to generate a strong demand for adhesive and sealants, while Europe market is facing challenges due to decline in construction projects. Adhesives and sealants market has been witnessing positive growth on the back of rising demand in automotive sector. The rising number of car ownership and increasing sales of passenger vehicles are pushing automotive manufacturers to adopt advanced adhesives and sealants to cater high-end quality vehicles. On the other hand, fall in prices of crude oil results in lower costs of some raw materials used in production of sealants and adhesives, offering the market opportunities for market players to increase the supply into the market. However, many key players expecting a hike in some raw materials after the oil prices started to amplify from early 2016 which are hindering the growth of global adhesives and sealants market. Key raw materials used in production such as propylene and ethylene, have significantly moving higher in recent months. Moreover, stringent regulation from legal environmental bodies is a key challenge to the market players. These factors are also encouraging the manufacturers to develop bio-based products to reduce carbon footprints, providing competitive advantage over synthetic counterparts. Growing automotive and packaging industry in various developing countries such as India, China, Singapore and others is one of the major growth driving factor for global adhesives and sealants market. The automotive industry is more focusing on replacing welding activities for engine and chases assembly with adhesives and sealants to reduce overall vehicle weight in order to achieve better fuel efficiency. Moreover, strong growth in construction industry on the back of rising urbanization in various emerging countries is propelling the demand for advanced adhesives and sealants. Vast application of adhesive and sealants in pressure sensitive operations based products such as paperboard & packaging, woodworking and footwear are expected to boost global adhesive and sealants market over the forecast period i.e. 2016-2024. On the other hand, rising popularity of bio-based products and eco-friendly adhesives over synthetic adhesives is one of the major factors which is shifting the adhesives and sealants manufacturers towards the manufacturing of bio-based adhesives and sealants products. 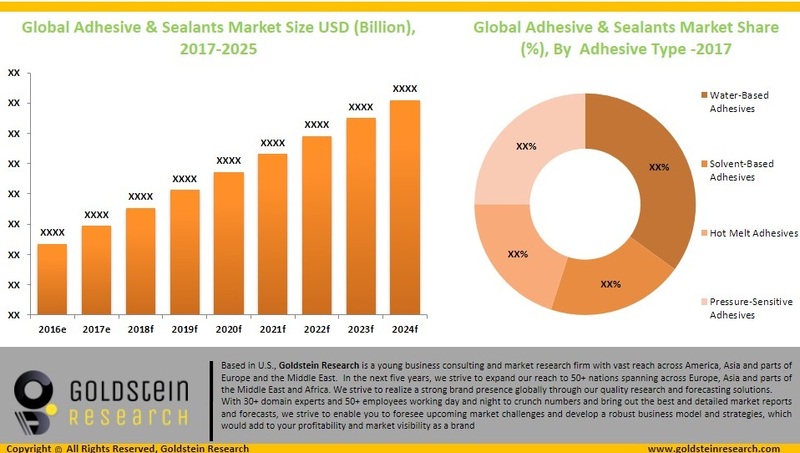 However, stringent environmental regulations related to VOC (Volatile Organic Compound) emission are hindering the growth of global adhesives and sealants market. Solvent-based adhesives have tendency to react with nitrogen present in atmosphere, which poses a threat for respiratory system. These concerns are creating pressure on the manufacturers to limit the manufacturing of synthetic adhesives and sealants. Additionally, rising prices of key raw material derived from processing of crude oil due to increase in crude oil prices, further restrain the growth of global adhesive and sealants market. The Global Adhesives and Sealants Market accounted for USD 43.6 billion in 2015 and expected to reach USD 62.8 billion by the end of forecast period i.e. 2024. Further the market is anticipated to expand at compound annual growth rate of 4.6% over the forecast period i.e. 2016-2024. Water-based adhesives generated a revenue share of more than 40% globally in 2015. The rising demand for water-based adhesives is the vast application of these types of adhesives in packaging and construction industry. Silicon-based adhesives contributed more than 30% share of revenue in adhesive and sealants market in 2015 due increased demand in end-use industries on the back of its chemical properties such as durability, strength and others. Geographically, Asia-Pacific region dominated the global adhesives and sealants market with a revenue share of 32.5% in 2015. Asia-pacific dominance is majorly driven by the domestic and industrial consumption of sealants and adhesives in growth countries including China and India with revenue accounted close to USD 12.5 billion in 2016. Likewise, North-America region followed by Asia-Pacific region, accounted for more than 20% share in global adhesives and sealants market. Although, rapid construction activities in Middle East & Africa region, especially in gulf countries such as UAE, Saudi Arabia, Oman is creating huge opportunities for the adhesives and sealants manufacturers to explore the untapped market. 7.1.8. Illinois Tools Works Inc.